We had a couple of interesting cultural excursions this weekend, both of them in full-on rapid French. The first, on Saturday, was the opening of a new summer exhibition at the Lace Museum in Brioude. Now, I have to admit that we’ve never visited the Lace Museum, because to be honest it really doesn’t sound that thrilling. It’s a bit like the Pencil Museum in Keswick – it’s always been there as a wet weather alternative, but we’ve not actually had to resort to it. Turns out we were wrong in this case. The museum is housed in a beautiful old building, and there is a lot of really fascinating social history as well as the exhibits relating directly to the lace-making industry in the region. It’s also a working studio, producing contemporary designs which are used by fashion designers in their catwalk collections. 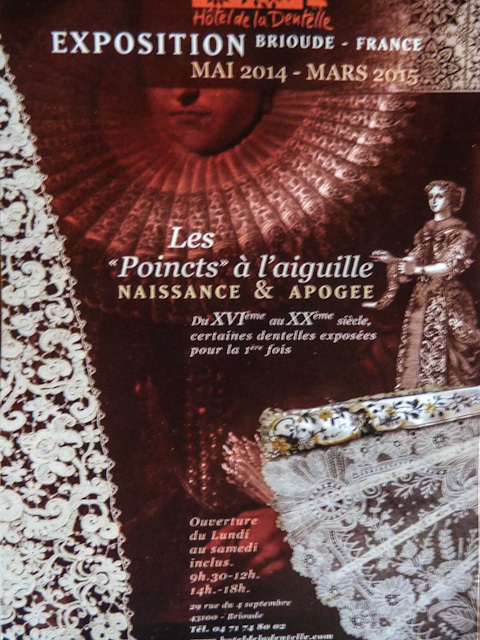 My French really wasn’t up to the introduction by Madame President, which seemed to be a potted history of lace-making, delivered at top speed, but I gather that the new exhibition relates to needle lace rather than bobbin lace, and that they have some exhibits dating back to the 16th century which have never been shown before. 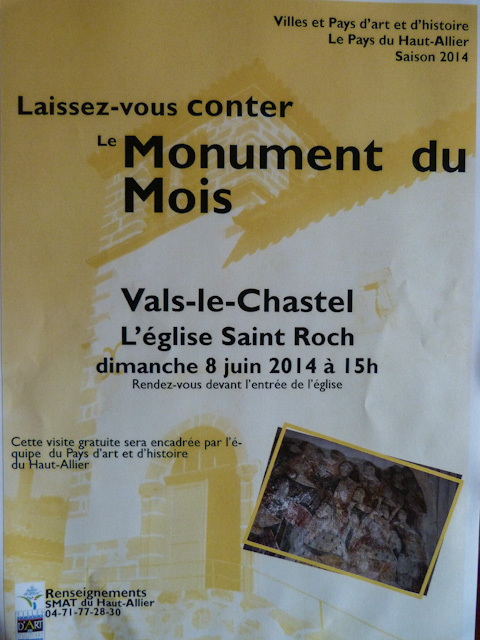 Sunday afternoon found us in the church at Vals-le-Chastel, which is our nearest village, for a guided tour. The church has recently undergone an extensive programme of restoration, which reinstated some of the original features lost during the nineteenth century. Again, the whole thing was conducted in high speed French, but I’m a bit more au fait with architectural terms, so managed to follow most of it. It was a fascinating couple of hours, which helped to explain why the church and castle in the village are so ‘bitty’ (blame the French Revolution). The most impressive features of the church are the 15th century frescoes in a small side chapel. 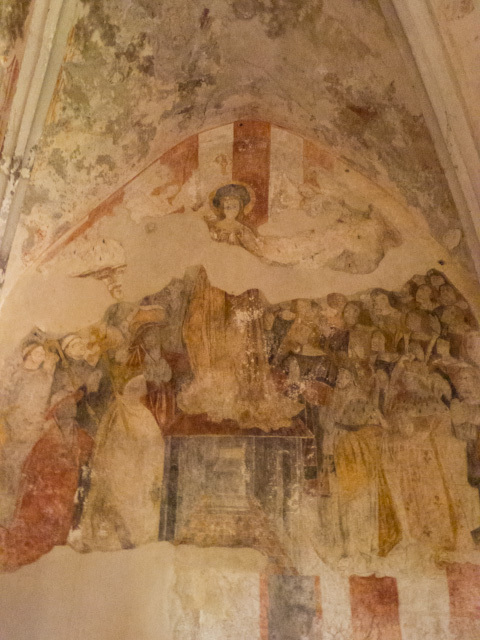 Sadly, much of the painting has been lost to time and damp, but most of a Vierge de Miséricorde, or Virgin of Mercy on the east wall is fairly intact. It features people sheltering for protection under the outspread cloak of the virgin Mary, and apparently refers to La Peste, or bubonic plague, which arrived in the region at around the time of the frescoes. All in all, a really interesting and informative tour. It was organised by a regional heritage organisation, who apparently run a series of similar guided tours around the area from March to June, and again in September and October. We’ll certainly be on the look out for the autumn programme this year. It’s been to hot to do anything much these past few days but we have been out and about a bit! A rainy day alternative? Hilarious. Actually, one of the most fascinating museums I visited in France is the fabric museum in Lyon.